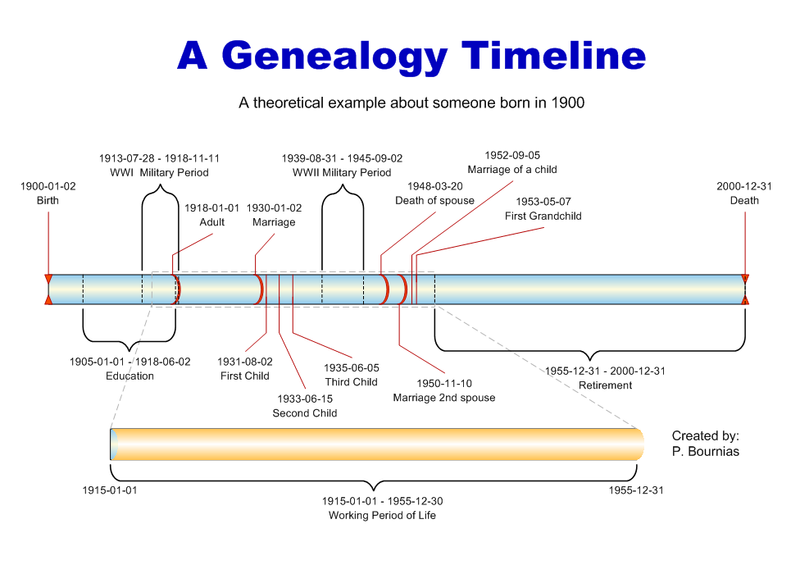 A Genealogical Timeline is a graphical method of discovery and association of historical events. The genealogical timeline links the historical timeline to the family and can display circumstances that surround the lives of the members of a family tree. This is an example of a genealogical timeline that displays a hypothetical individual’s life from birth to death and the trail of historical facts that can leave a genealogy trail of information. Of course, in 1900 the average child in Greece may have completed one year of schooling in comparison with the 12 years that children may do today and that depends on the country. Every aspect of life creates markers that can lead us to different clues regarding the family member’s genealogy. Other genealogy timelines may include historical facts about what was happening during the time period of the individuals in addition to personal facts. The example shown here was created using Microsoft Visio.